The Deluxe Villa resorts at Walt Disney World are a strange lot. Since they are technically Disney timeshare resorts, most of the people who stay there are owners, or guests of owners. A few people are normal Walt Disney World guests that stay there by paying for their room just like any other Walt Disney World resort. The deluxe villa resorts, for the most part, offer studio, one and two bedroom villas (most have a very limited number of three bedroom villas). If you have a larger group and want to stay in one “room”, the villas are exactly what you are looking for. In addition to the size, you also get a full kitchen in the one bedroom villas and larger (the studios all have a kitchenette). 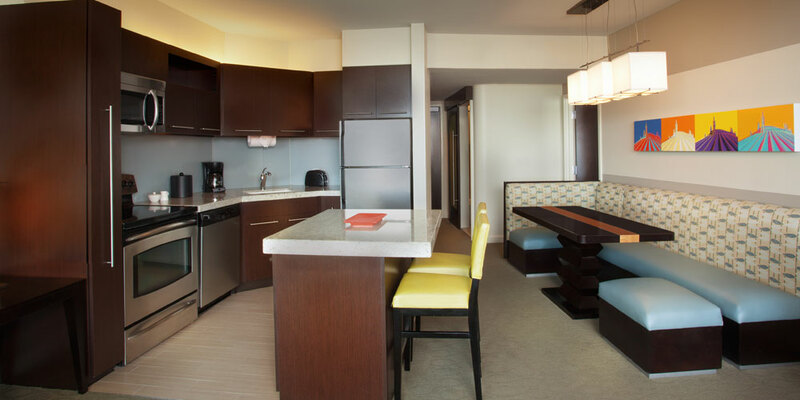 The one bedroom and larger villas also have in-room laundry facilities as well as a living room. If you are just looking for a place to sleep, I would take a look at a Value resort, it may fit your needs and budget a bit better. But if you are looking for comfort, convenience and class, the deluxe villa resorts are the way to go. 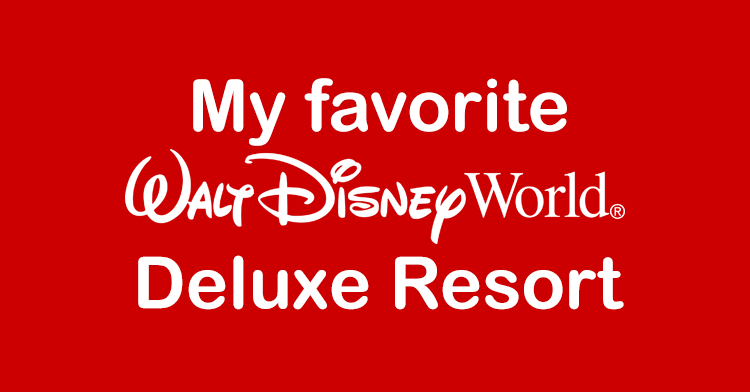 What is My Favorite Disney World Deluxe Villa Resort? This is a hard one. I have stayed at every Deluxe Villa resort at Walt Disney World, with the exception of the new Polynesian Bungalows. They are spendy, and I am having a hard time rationalizing spending $2,000 per night for a hotel room at Disney. I have been in the Bungalows, and they are stunning. Based on the room alone I would recommend them, if you have the cash, but they are so expensive they are excluded from my top spot. I narrowed my choice down to three options, Beach Club Villas, Bay Lake Tower and the Villas at the Grand Floridian. All three are great options, and for my family, the Beach Club Villas is usually the choice since it ticks most of our boxes, but personally, my favorite Deluxe Villas resort is Bay Lake Tower. Disney’s Animal Kingdom Lodge – Kidani Village and Jambo House: Escape on your own African safari adventure at this magnificent Resort hotel. Inspired by the traditional African kraal, the horseshoe-curved design offers exquisite views of lush savannas—where over 30 species of African wildlife freely roam. Delight in dazzling pool areas, exciting animal programs and all the comforts of home in our spacious Studios and multi-bedroom Villas. Disney’s Saratoga Springs: Inspired by historic Saratoga Springs—a late-1800s’ New York retreat famous for its spas and horse racing—this charming, Victorian-style Resort hotel is nestled between rolling golf course greens and the shimmering Village Lake. Delight in stately Studios and multi-bedroom Villas, dazzling pools and a spa. You can also explore the fun activities and exciting dining options of Disney Springs, just a boat ride away. Villas at Disney’s Wilderness Lodge: Recalling the 1860’s railroad hotels of the American West, The Villas offer the comforts of home amid the rustic beauty of Disney’s Wilderness Lodge. Dine on traditional Pacific Northwest cuisine, explore trails through lush meadows and delight in the enchanting Silver Creek Springs Pool. Just a breezy boat ride to Magic Kingdom park, this Resort hotel celebrates the ethos of traditional craftsmanship and the great outdoors. Disney’s Boardwalk Villas: Timeless elegance meets old-fashioned charm at this waterfront Resort hotel. Delight in saltwater taffy-colored cottages, private courtyards and picturesque gardens—plus the ragtime sounds and carnival pastimes of the exciting Coney Island-style boardwalk. Reminiscent of turn-of-the-century Atlantic City, Disney’s BoardWalk Villas is located within walking distance to both Epcot and Disney’s Hollywood Studios. 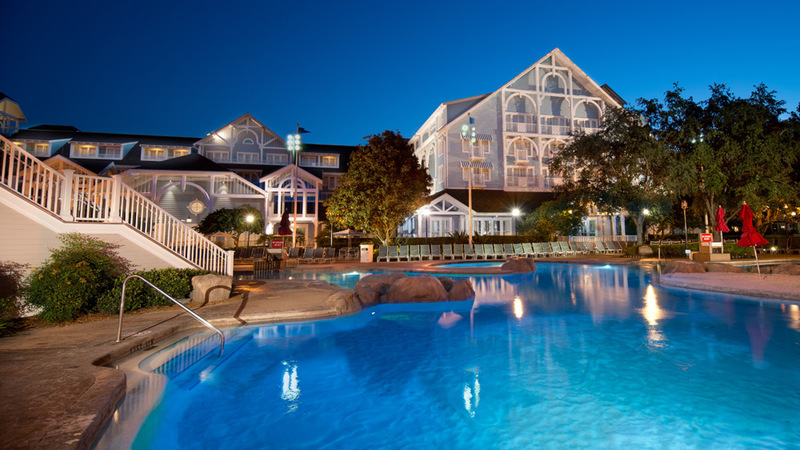 Disney’s Beach Club Villas: Leisure, elegance and romance abound at this charming New England-style beach hotel—in easy walking distance to Epcot and a boat ride to Disney’s Hollywood Studios. 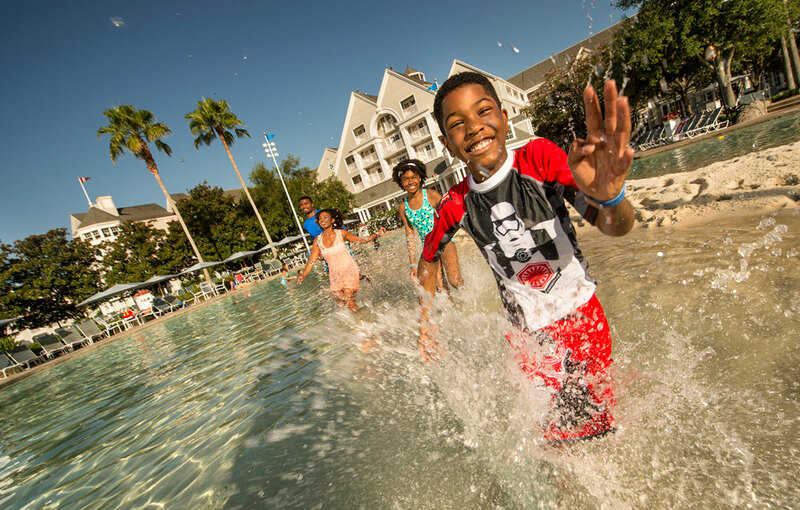 Enjoy the pools, spas and lagoons of Stormalong Bay, and the many amenities shared with Disney’s Yacht & Beach Club Resorts. Disney’s Polynesian Villas & Bungalows: Escape to an enchanting oasis of swaying palms, white sandy beaches and tropical surroundings that evokes the languid spirit of the South Pacific. Disney’s Polynesian Villas & Bungalows makes its home at one of the original—and legendary—Walt Disney World Resort hotels. 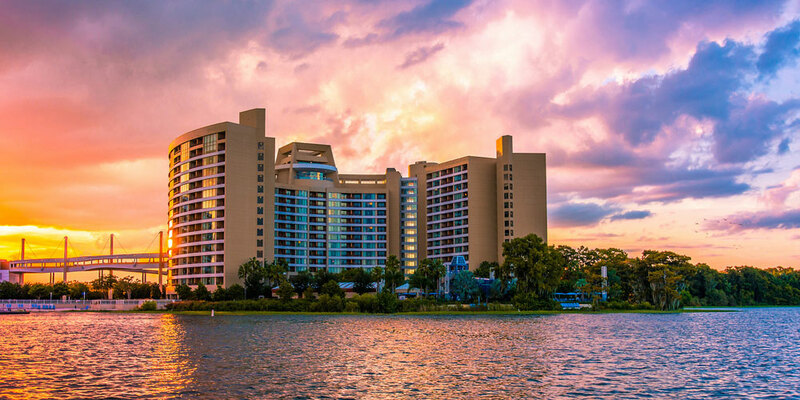 Bay Lake Tower at Disney’s Contemporary Resort: Warm luxury meets modern elegance at this lakeside Resort hotel just walking distance to Magic Kingdom park. Delight in Studios and multi-bedroom Villas, kitchens or kitchenettes and dramatic views that may include old-growth cypress trees, the shimmering Bay Lake, the lush courtyard or Cinderella Castle. 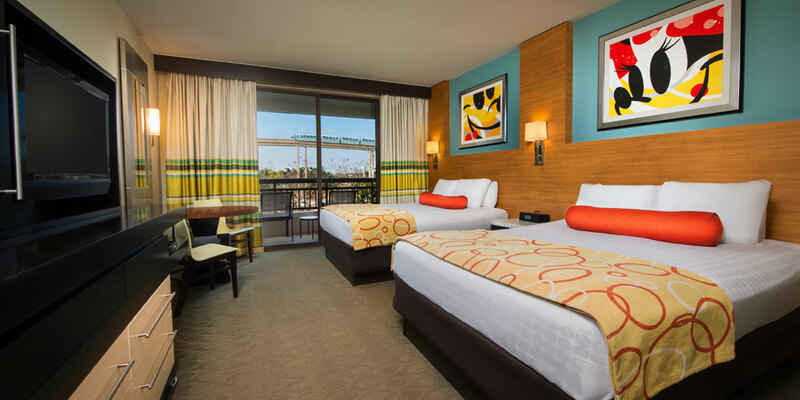 Enjoy white-sand beaches, enchanting pools and award-winning dining—plus the extensive offerings of Disney’s Contemporary Resort, connected by the convenient Sky Way Bridge. The Villas at Disney’s Grand Floridian Resort: Revel in Victorian-style splendor and enjoy the comforts of home at this elegant Disney Resort hotel. Stay in a stately deluxe studio or multi-bedroom villa. Indulge in a luxurious massage at the full-service spa. Unwind on the beach as fireworks light up the sky over Cinderella Castle. Just one stop to Magic Kingdom park on the complimentary Resort Monorail, this timeless marvel evokes Palm Beach’s golden era. In addition, Disney is currently building additional units and on water cabins at the Wilderness Lodge. Once finished the current Villas at Wilderness Lodge will be renamed Boulder Ridge Villas while the new villas and bungalows will be named Copper Creek Villas & Cabins. There will be two separate resorts at Wilderness Lodge, similar to Animal Kingdom Lodge. Location, location, location. Bay Lake Tower is built between the Contemporary Resort and the Magic Kingdom. Most rooms have a fantastic view of either the Magic Kingdom or Bay Lake. Unless Disney someday builds a resort inside the Magic Kingdom or Epcot, I can’t imagine a better spot for a resort. Transportation Options. So many options. You can easily walk directly to the Magic Kingdom in just a few minutes. You can also grab the resort monorail to go to the Magic Kingdom or Epcot right in the lobby of the Contemporary. There is also bus service that will take you just about anywhere on property and a boat launch that serves the Magic Kingdom as well as the Wilderness Lodge and Fort Wilderness. Especially when you are in the Magic Kingdom at night, it is so nice to have multiple options to get home. If you aren’t dead, walk home in just a few minutes. Feeling tired? Take the monorail or a boat back for a leisurely ride. If you are staying elsewhere, you may be reliant upon the buses, and those lines can get LONG once the park closes. The Rooms. 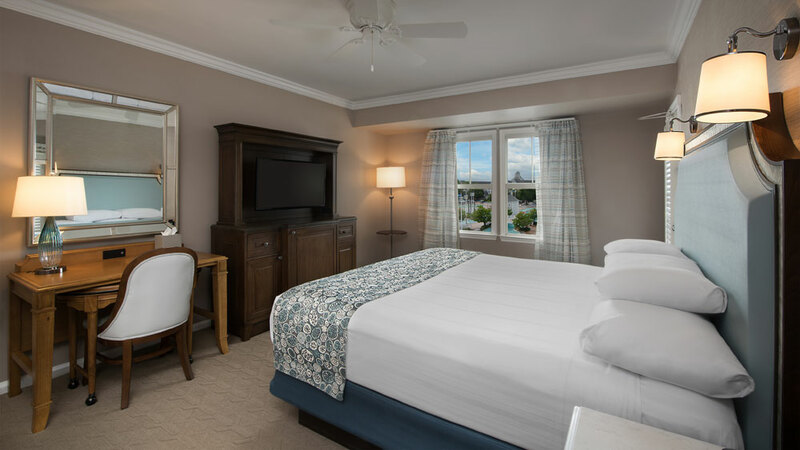 The rooms at Bay Lake are different than any other deluxe villa resort. Since the building is somewhat of a semi-circular tower, the rooms that face outward are fan shaped, so the area where the windows and balcony are located are huge. This makes for great views in all directions. Plus, the decorating and feel of the rooms is just spectacular. Each two bedroom villa features an extra bathroom in the living room area, which is great if you have anyone that has to sleep on the fold out couch or chair in the main room, they have their own bathroom. What are the downsides of Bay Lake Tower? Studio rooms: In deluxe villa resorts, the two bedroom villas are made up of a one bedroom villa and a studio combined. When you have a 2 bedroom villa, that second bedroom (studio) isn’t perfect, but it is just fine. However, if you rent just a studio, beware that it is TINY! They have built out a kitchenette/closet area in the room, and past that there is usually a queen bed and a fold out couch. Once you fold out the couch, there is basically no walking or storage room for anything, it feels much smaller than a value resort room. If you are thinking of a studio at Bay Lake, just pass, and book a standard room at the Contemporary, they are usually about the same price and are much better. Decor: While I love the decor at Bay Lake, I can understand that it isn’t for everyone. Since it is associated with the Contemporary Resort, the decor is on the contemporary side. If you want more traditional decor, you can’t beat the Villas at the Grand Floridian, they are down right stunning inside. Cost: The deluxe villas are pretty expensive if you are paying for them (even if you are an owner). They are never a way to save money for a larger group, and you will pay deluxe prices, these are deluxe villa resorts after all. A two bedroom villa is usually in the $1,000 – $1,500 per night range, so a week stay there is not cheap. While I would be more than happy staying at any Deluxe Villa resort, if given the choice, I would stay at Bay Lake Tower just about every time. Have you stayed at Disney’s Bay Lake Tower?